1996-97 Stadium Club Rookies 2 #12 Steve Nash Rookie (Phoenix Suns) in mint condition. 2003-04 Upper Deck Top Prospects #3 Lebron James Rookie (Cleveland Cavaliers) in mint condition. 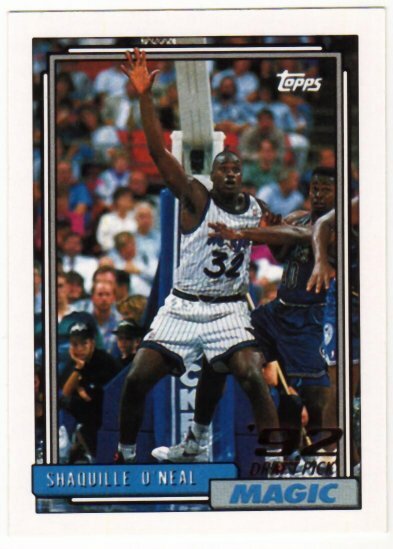 1992-93 Upper Deck #1b Sgaquille O'Neal TRADE Rookie (Orlando Magic) in mint condition. 1975-76 Topps #254 Moses Malone Rookie (Utah Stars) in nmt condition. 2003-04 Topps Rookie Matrix #KHW Dwyane Wade/Chris Kaman/Kirk Hinrich Rookie in nmt condition. 1999-00 Ultra #149 Andre Miller Rookie (Cleveland Cavaliers) in mint condition. 1999-00 Topps Gold Label #93 Andre Miller Rookie (Cleveland Cavaliers) in mint condition. 1999-00 Topps Gold Label #88 Baron Davis Class 2 Rookie (Charlotte Hornets) in mint condition. 1999-00 Upper Deck #158 Baron Davis Rookie (Charlotte Hornets) in mint condition. 1999-00 Upper Deck #171 Ron Artest Rookie (Chicago Bulls) in mint condition.